In UNIGINE, instances of C++ API classes (such as: node, mesh, body, image, etc.) only store pointers to instances of internal C++ classes, they cannot be created and deleted via the standard new/delete operators. So they should be declared as smart pointers (Unigine::Ptr) that allow you to automatically manage their lifetime. UNIGINE has its own optimized memory allocator for faster and more efficient memory management. Each smart pointer stores a reference counter, i.e. 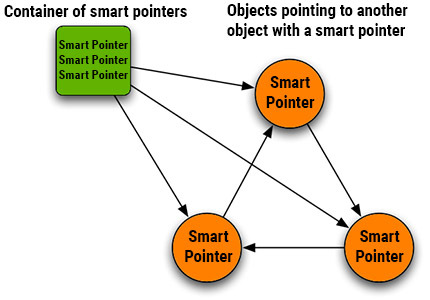 how many smart pointers are pointing to the managed object; when the last smart pointer is destroyed, the counter goes to 0, and the managed object is then automatically deleted.